The Pulitzer-prize-winning author (Fire in the Lake) turns a penetrating gaze on four recently evolved "communities" which, she contends, exemplify America's unique penchant for abandoning the culture of the mainstream to set up diverse, self-contained societies. The first of these is "The Castro," a San Francisco neighborhood of young, primarily male homosexuals who once believed that they were at the forefront of the Sexual Revolution. In recent years, AIDS has decimated their numbers and virtually destroyed their political and social activism. Like the Castro, the retirement community of Sun City, Florida, is "something new under the sun." History has never recorded an overtly gay male community with its own tribal rituals and political organizations, nor have towns restricted entirely to older people existed prior to the mid-20th century. On the other hand, Reverend Jerry Falwell's Liberty Baptist Church of Lynchburg, Va., and his vociferous Moral Majority are neither unique nor particularly new. 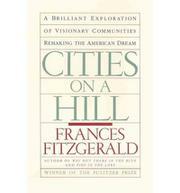 Fitzgerald documents their roots in the revivalist upswing of the 1820's and the later "born-again' Christian movement. Falwell's constituency is, however, a community apart from the mainstream in that it adheres to a way of life in which moral values, political judgments and day-to-day decisions are dictated from the pulpit--electronic or actual. The most bizarre community Fitzgerald scrutinizes is the Oregon town called Razneeshpuram, which attracted numerous well-heeled professionals devoted to joyous consciousness-raising and to the establishment of a unique center for worldwide spiritual enlightenment. Almost from its beginnings, the commune alienated its neighbors and, eventually, all of Oregon. It self-destructed in a series of lawsuits and government fraud citations. In analyzing these societies, Fitzgerald supplies a wealth of information on the economic, cultural, spiritual and political forces that brought them about. She virtually immerses herself into each and hobnobs with the people involved in them and with their leaders--except for the guru, Rajneesh, who had taken a vow of silence. The end result is reportage of imposing depth and breadth. Her insights are fascinating, sometimes amusing, often troubling and always stimulating.